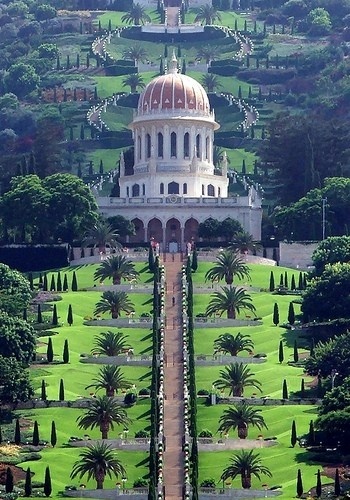 The Terraces of the Bahá'í Faith, also known as the Hanging Gardens of Haifa, are garden terraces around the Shrine of the Báb on Mount Carmel in Haifa, Israel. They are one of the most visited tourist attractions in Israel. The architect is Fariborz Sahba from Iran, the structural engineers are Karban and Co. from Haifa. Along with the Baha'i Holy Places in Western Galilee, it is a UNESCO World Heritage Site. Nine concentric circles provide the main geometry of the eighteen terraces. Just as the identification of a circle presupposes a centre, so the terraces have been conceived as generated from the Shrine of the Báb. The eighteen terraces plus the one terrace of the Shrine of the Báb make nineteen terraces total. Nineteen is a significant number within both the Bahá'í and Bábí religions. Fariborz Sahba began work in 1987 designing the gardens and oversaw construction. The terraces were opened to the public in June 2001. Beginning at its base, the gardens extend almost a kilometre up the side of Mount Carmel, covering some 200,000 square metres of land. The gardens are linked by a set of stairs flanked by twin streams of running water cascading down the mountainside through the steps and terrace bridges.